In the past 2,000 years, the people living in the Arctic evolved from simple hunting and gathering traditions to complex, hierarchical societies. They organized to hunt whales, developed villages with complicated social structures, made alliances with other groups and had times of peace and war. And they did this living in one of the world's most inhospitable environments. Archaeologists have documented those societal changes, but none have yet answered the question: Why? Or, in other words, what prompted that social evolution? University of Washington Ph.D. candidate in archaeology Shelby Anderson hopes to develop a good answer. For about three years, Anderson has been studying the evolution of arctic cultures into complex social, economic, and political organizations using an approach that hasn't yet been applied in the far north. She's studying pottery. "We have historic records about how people were living in the Arctic in the 18th century, and they had amazing technology, artwork and impressive social networks and structures," said Anderson. " We have a faint record, through both archaeology and oral histories, of what life was like long before that, but we don’t really know why the rapid social and technological changes evident in the archaeological record over the last 2,000 or so years took place. I want to know how and why that happened." Existing records and data show that the populations in the region peaked roughly 1,000 years ago. Populations concentrated along the coast, and then, about 500 years ago, people began dispersing. Less is known about where they went and how their cultures evolved, Anderson says. Like many archaeologists who have teased out complex mysteries about native tribes in America's southwestern region, Anderson is looking to pottery to provide clues and evidence of growing cultural sophistication. By analyzing pottery shards and "sourcing" them to specific regions, she aims to understand when trade between certain groups started, to trace the trade routes, and to understand which groups controlled access to the land that held the clay. "I'm hoping to use pottery as a proxy for understanding if and how groups controlled access to raw material resources, which is a hallmark of more complex social and political structures, and also to understand the movement or distribution of pots and pottery styles, which is evidence of trade, mobility and group interactions." Specifically, Anderson is studying archived and newly acquired pottery collections from Alaska's Cape Krusenstern, the northern and central Seward Peninsula, including Cape Espenberg, the shores of Kotzebue Sound, and the Noatak and Kobuk River valleys. Working with the University of Missouri's Archaeometry Laboratory, she is analyzing the chemical composition of pottery shards to hone in on where in the region the clay that made them came from. She will also analyze the minerals used to temper the pots to source these materials. A major component of Anderson's research involves better understanding settlement patterns. Currently, more data exists on coastal populations. But as the people moved inland, the record of their settlements is sparse. Anderson will conduct precision mapping and dating of archaeological features around this region, using these data to better understand regional settlement and population change. 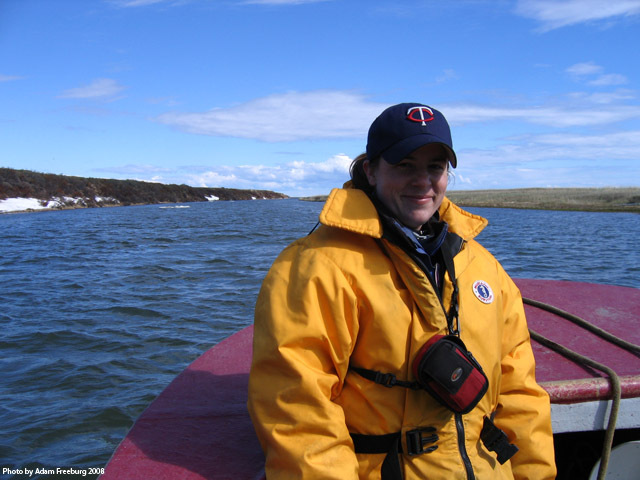 Anderson's research—now in its final year of fieldwork—will help paint a better picture of the complex, multi-faceted societies that evolved on both sides of the Bering Strait, she said. In the past 2,000 years, the different groups in the region formed strong regional identities that led to marked differences in styles and subsistence and eventually led to the expansion of Thule whale hunters eastward across the Canadian Arctic. The relationships, interaction, and evolution of these ethnic groups remain among the most unresolved issues in the archaeology of the region, said Anderson. Often, archaeology focuses on what a population does and looks at cultural products, she said. By contrast, her research looks at why the populations evolved as they did. "It's always fascinating to have long-term data on human behavior," said Anderson. "My research will be relevant to others studying in the Arctic, as I try to answer bigger anthropological questions about why social change took place." Anderson's research is funded by the National Science Foundation and conducted in partnership with the National Park Service.